I do. Take copyrights seriously. I also give credit where it is due by saying so and providing a link wherever possible. Recipes cannot be copyrighted. Culture cannot be copyrighted. Images are. Recipe methods are and can be. What sense does it make to steal other people's images and present them on your own blog without attribution? In many cases, a simple email asking for permission is all it takes! Why copy a recipe from another source word for word? And even use their picture? You know who you are. You know where the discussion is. It's available publicly. I chose to inform. I left my name and address. You learned. Now there is at least one less person in this world who will take other people's content and use it as their own. That you chose not to publish my apology for assuming that yet another image was perhaps not your own and my kudos for taking things in the right spirit, is your decision. What you post on your blog reflects on you. What you allow to be posted by way of comments on your blog also reflects on you. Just as what I post and allow to be posted on my blog reflects on me. I say to you: Congratulations! On giving attribution where it was due. On actually making the recipe you posted and uploading your own images. Bravo! You got the message. I take copyrights seriously. Ask Indira how she feels. She'll tell you. Ask Barbara. She'll tell you how she feels. I'm glad you finally got it. I know how you feel. I recently found my roasted tomato recipe, copied word-for-word posted on RecipeZaar as someone's personal recipe for roasted tomatoes. A few months back I stumbled on a blog that had four of my posts completely copied, even the photos. I had to threaten to report her to Blogger to get that person to credit me. It's shocking. I've come across two in the last month, one for Heidi at 101 Cookbooks, another via Blogher. I wish someone would start a list of plagarizers to share via e-mail. This way we could all be on the look-out, especially for the ones that "appear" to be legitimate personal blogs vs the obvious click-collectors. It would be a real service for the food blogging community, even if the list itself should be offline. Manisha, it is not only with blog. a few days back I found most of my recipes posted on a yahoogroup claiming those are his recipes. I was very surprised. I saw the person was copying from many blogs and was worried what to do about it. Then one day, one of the other members sent a mail to the group saying all those recipes were copied and now it is stopped. Few days back I also found one site where my posts were copied word to word. I feel so bad..here we take so much pain to write each and every recipe and someone just claims them :(. How right you are?? Sometimes I go from one blog to another, what do you see! Same recipe with photos too! !I think" wait a minute ,did see double" and check again!! YUP!! there it is! !It's amazing how shameless some people are! I don't mind if somebody reproduces my recipe if they say "this is from so and so", that's enough for me.I realize lot of Indian dishes have similar recipes but you can feel sometimes if it's copied.I mostly blog about my home's traditional recipes and it hurts! But how do you prove??!! Bummer!! first of all, ur blog really does rock! i love it and have thoroughly enjoyed reading it. i can't [well actually i can since nothing surprises me anymore, unfortunate but true] believe people do this. i guess in the end u have to take it as complementary — though that is debatable and nobody wants their hard work stolen and claimed as original work by someone else. i'd be pissed something fierce too. i saw something somewhere [i know that doesn't help u right now] in a blog that blocks people from copying. have u checked that out? perhaps "watermarking" your photos with photoshop? i will look back and try to see what the name was if u r interested. i don't know if it's free. Kalyn, it's great to have you here at IFR! I'm a fan of your blog and your Weekend Herb Blogging! I must, however, make a few clarifications: the stolen material was not mine. It belonged to someone I know online and was announced in a discussion forum that I participate in. I looked at the blog and it appeared that the blogger was quite clueless. I chose not to be anonymous and left comments that would help this person fix the mistakes she was making. Well, she fixed the ones that were pointed out to her. She then enabled moderation, deleted comments that made her look bad, did not post comments that pointed out what she still needed to fix and then posted a nasty rejoinder to one of my comments that didn't read well in isolation. The offending blog has been taken offline. A good thing and certainly no loss by way of content. Because this morning, it was discovered that there was yet another image that she had posted without attribution thereby claiming it as her own, belonged to another member of the same discussion forum! Taking the blog offline was the best thing she could have done at this stage. Earlier, all she needed to have done was apologize for her mistake and undo her infringing actions. People do forgive. She chose to play games and only take off what we knew was not hers. I'm so sorry about what you had to go through, Kalyn. It's just not right. Alanna, Copyscape is your friend when you are trying to find stolen material. Stolen images are more difficult to find. People think that since they are available through image search engines, they are free for the taking. They don't consider copyright or permission or attribution. A list of plagiarists is an ideal solution but would be difficult to maintain. One suggestion could be a team blog where instances of plagiarism on blogs are reported. If the plagiarist rectifies the infringement, take the post offline or unlink all links in that post that point to the offending blog. An online list would probably have more profound effects than an offline list. Shilpa, recipes will be copied. There's not much we can do about it. It's the blatant disregard for copyright that is shocking. To take it and replicate it word for word and take the credit for it is quite disgusting. The unfortunate thing is that in most cases bloggers have to work alone to prove that the content is their's. Very often, you will find people offering support from the sidelines but no-one really gets involved beyond a point. In your case, I'm glad that someone realized that there was a problem and put an end to it. Perhaps we need to start a support group against plagiarists. Asha, same recipe is something I can understand. I have had many other bloggers say that they make the same lemon pickle I have on my blog. Same pictures? No! It's a copy! Proof? Who published it first, although the dates on posts can be easily manipulated. I think RSS feeds show the date on which the post was sent to the feed and the date on which the post was updated. If you can identify that the image is yours, then you can ask the blogger to take it off or attribute it to you by linking to you. If they refuse, you can complain to their web host with proof. If it is a Blogger hosted blog, you can report a TOS violation through this form. burekaboy, welcome! Thanks for all your warm words; I do appreciate it! Please feel free to link to my blog for as long as you find it useful! People do ridiculous things like this for several reasons: in most cases, they are ill-informed; in other cases, they don't care or are just too lazy to create their own content. Greed by way of ad revenues is another. My photos on Inner Lens are published in the public domain so even though the copyright remains with me, anyone is free to copy them and make derivative works from them. However, that is not the case with my food blog. Watermarking is one option. Visible watermarks take away from the full impact an image can have. Invisible watermarks are those that can be identified algorithmically but you would need the digital software that has this capability in order to both, place the invisible watermark as well as detect it. Does Photoshop have that feature? Do let me know if you find out more! We need to start teaching these things to our children from the very start. Medha does a lot of online research for her projects. She has been taught that she must write her findings "in her own words". This tells me (and her teacher) how much she has understood, to begin with. She also knows that it is cheating to copy verbatim. The other thing she knows is that she gets into worse trouble for lying in order to cover up for a misdeed than if she had owned up to the misdeed in the first place. Maybe there are a lot of adults and bloggers out there that need to learn these same basic lessons. The other blog which I mentioned, I think they used the RSS feed or something...it used to catch all the posts from my blog and post it on that blog. Due to some features of wordpress, I came to know about it. If at all you get to know any good way to stop this, please please post here, I want to follow it. In last 8-9 months I have spent almost all my time on developing the blog to what it is today and if people can't give even a credit, it really really hurts. You can add copyright information to Photoshop images and notify users that an image is copyright-protected via a digital watermark that uses Digimarc ImageBridge technology. The watermark—a digital code added as noise to the image—is virtually imperceptible to the human eye. The Digimarc watermark is durable in both digital and printed forms, surviving typical image edits and file format conversions. For more detailed information on embedding Digimarc digital watermarks, refer to the Digimarc website at www.digimarc.com. To embed a digital watermark, you must first register with Digimarc Corporation—which maintains a database of artists, designers, and photographers and their contact information—to get a unique Digimarc ID. You can then embed the Digimarc ID in your images, along with information such as the copyright year or a restricted-use identifier. i hope that helps u out a bit. should u want/need more information please feel free to contact me. i can well appreciate your annoyance and your wanting to protect YOUR ORIGINAL work from other who feel it is okay to steal. i spend a considerable amount of time researching topics, preparing my postings and the upkeep of everything. as u, and others know, it takes a lot of your own time. someone coming along and claiming that is it is their own is a violation. i also well appreciate your teaching of your daughter the necessity of not copying verbatum. this is the only way. unfortunately a big segment of our society does not seem to respect this. I'm glad to hear that the matter was resolved well. Recipes are a pretty strange area of copyright law. Since facts can not be copyrighted, ingredient lists and simple steps can not be copyrighted but descriptions, instructions (if sufficiently creative) and images can. It's a very unusual and very fuzzy fine line between the two elements that can cause a lot of grief. It is very possible to steal a recipe without violating the law, but doing so without overstepping the bounds can be very tricky. Clearly though, stealing images is an infringement and that problem seems to be growing when dealing with recipes. The instructions are really a dime a dozen in many ways, it's the photo and the surrounding work that goes into it that really seems to be more valuable. Regardless, if you encounter these issues again, feel free to contact me using the form on my site, I'll gladly see if there's any way I can help. Good luck with your struggles and congrats on doling out some education. I hope it sticks. Thank you very much for that information on digital watermarks. I really appreciate it. I am definitely going to look into it. Jonathan, welcome! I read a few articles on your blog, Plagiarism Today, and I am really impressed with the headway you have made in fighting plagiarism, as well as the information you make available. I am sure that many others will find your blog a great read. Thank you so much for everything you do. It is indeed frustrating that such blatant plagarism happens and utterly inexcusable when a big gun like TOI is the culprit! unbelievable!! Hey I have been blogging for over a month now.But 'Taking copyrights and attribution seriously' has shocked me!I didn't know such things can happen!It is really disturbing.I am a working girl with a 15 month baby...u can imagine the efforts put in to take pics and writing recipes! !and someone steals them! !really bad.but thanks for the alert!! I am glad you address this issue. there is a very good article here that addresses the copyright of recipes. I never mind when people use or are "inspired" by one of my recipes. I would not feel good though if it was copied word for word though. What I would never stand for is if someone used one of my pictures and give it out as one of theirs. I take great measures and invest a lot of time for each of my photographs. I have no problem when someone uses my picture and gives the credit to me with a link to my blog and informs me prior to this, but I think i would o ballistic if I ever found my pictures without a mention. The sad truth of all this however is that it just is not possible to control and these people know this. That is why they constantly plagerize and steal. Even though this person stopped her blog, there are still many like her out there. And what is to say that this same person will not start another blog with the same method of stealing contents and photos. Manisha, I do find it quite honorable and like a true friend that you stood up for your friends work against this person. I only hope that should anyone come across my wok they would do the same. I know I would. The idea about a blog listing with the names of black-listed blogs and their writters is a fantastic one. Maybe something to address at the Food Blog S'cool! Totally understand your frustration Manisha...hope the concerned person read it and understood the gist of what you want to say...Watermarking images is such a sad idea especially when we take efforts to click a beautiful picture- I;ve seen one such blog where she has copy pasted several recipes, with her own introduction, and no mention of a credit anywhere...absolutely immoral people! Yes, ToI has been guilty of lifting pictures from blogs and web sites. First, Indira's picture and then a well-known photographer's. I don't have much respect for the online ToI in any case. When they started stealing pictures, their reputation reached rock-bottom in my eyes. It's pathetic journalism interspersed with images of models in various state of undress. And in most cases, the theft goes unreported. Not even blogged about. Sad but true. Madhuli, welcome! Sorry to burst the bubble for you :-( but there are enough people out there who will take what they see for free. Most of the people who do it are just not aware that it's wrong to do so. Nabeela, look what I found. If the poster is you or someone you gave permission to, then this is a non-issue. If it isn't, then you may want to take it up with Yahoo! Meeta, thanks for that link. It's a great article. I think given all the gray areas, it's just better to give credit where it is due. There's no confusion. I hear ya on the photograph issue! Your photos are very creative and inspiring! It might be a good idea to take this up on Food Blog S'cool because they already have the traffic to make a difference. It has to be a joint effort because you cannot be everywhere at all times. If we look out for one another, we'll at least get people to be aware that they can't just copy-paste or save and use without attribution. I keep repeating that all it takes is an email to ask for permission! Not everyone is comfortable with sharing their work. So be prepared for a 'No' and also honor the 'No'. And either take your own picture or go find another one. Nandita, I can only hope that this person understood what I was saying. I hope she makes a fresh start and gives credit where it is due. Digital watermarking is invisible but it doesn't protect you from theft. It just helps identify the image as yours if you find it being used without your permission. Visible watermarking just takes away from the image. If the blog you are talking of is hosted on any of the free services, you can report it to the service provider with proof and they usually are quite proactive and will take it down. It is usually against their TOS. On the other hand, it's like playing Internet police. But the thing is that unless we all speak up together and create awareness, nothing is going to change. The unfortunate truth remains that the onus is on the victim to prove that they were ripped off. - add a copyright statement at the beginning of each post in the RSS feed only. It is easy to filter out text that always appears in a standard format so this is not foolproof. If your feeds are being posted without attribution then you can complain to their web host. If the blog is hosted on a free service like Blogger, Wordpress, Yahoo! and so on, you can complain to their abuse department. If the blog is hosted with a web host, then do a whois on the domain name and contact the web host letting them know that they are hosting a web site or blog that indulges in plagiarism. If the blog can be found in Google then you can report them for violation of DMCA. Jonathan of Plagiarism Today also has information on DMCA. Hey Manisha... thats indeed sad to hear... but how did you find out?? I don't mind bloggers copying as long they give credit to the website they copied from!! Priya, in this particular case, I found out because the person whose picture was stolen is a moderator on the discussion forums that I hang out at. Attribution to source should be the first thing all bloggers need to be aware of. It's really not that difficult to find clones of your content. copying is one of the most worrying thoughts when we blog. after all the effort that is put into each post, each photo, to have someone just take it, is akin to kidnapping. Kudos to u for standing up to it and my support in any form of forum, or black listed blog site that is to be started. It's great u stood up for others. Regarding deleting comments that makes them look bad I personally have seen it happen in a certain blog which everyone goes to pretty often.It's nothing new.If a person can't take the good/bad comments then I feel the person is very shallow and should not blog. KA, it's happened to me at work. And I was told in so many words: "Sorry to steal your thunder!" I couldn't believe it. I thought I had left that behind in grade school. I dealt with it and won in more ways than one. I hope you haven't had to go through something like that! Meena, thank you for tagging me. You are the third person to tag me. Faith of Mekuno cooking tagged me 3 weeks ago, Shilpa of Aayi's Recipes tagged me earlier this week and now you! I will get to it, I promise! I found your blog (linked from some other blog :D). Anyways, I am shocked that people are stealing your lovely recipes! I am a new blogger and would surely hate it if someone stole my recipes! Hope it doesn't happen again. Kavita, welcome! The case in point was stolen images and a recipe copied word for word from a commercial web site. It was not my recipe that was stolen. The objective of this post is to raise awareness about copyrights and ownership of content and materials published on the web. It's not a free for the taking. What happened? It is so sad when people do this. Which blog is this Manisha? You could leave a comment on my blog and then delete the comment immediately. I would get the comment in an email,but when you delete the comment,none would be able to see. I think one should first blog for oneself, not for good comments or for others. Then none will do this. Then if we get comments and get buddies, it is an added plus,thats all.. Sorry Manisha. Really Sorry. Please do delete this If I have crossed the line. OMG Manisha, thanks for pointing that out to me...I never gave my marag recipe in yahoo answers...Gosh! I don't know how to solve this issue....how did you even know about it? How do I search if somebody is copying from me online ? By putting in a phrase I wrote on my blog into google and see what it comes up with? Inji, crossed the line? I don't think so. :-D I love to read everyone's opinions. It leads to intelligent discourse. I have reached a stage where I can certainly do with that! I read food blogs mainly through my RSS-reader and click through to the site only if I have a question. Now I am cutting down on that, too, because many times the blogger just doesn't know or there is no answer. What happened with me was slightly different. I am not sure parallels can be drawn simply because this was from a person who was stealing other people's pictures and who misrepresented a recipe she had copied word for word from another site as her own. Nabeela, Copyscape is your friend and you can also look for exact phrases from your recipe by enclosing them in quotes and then searching in Google. I came upon it when I was looking for more information on marag. Check out #14 on Yahoo! Community Guidelines, and quote that to report abuse by following the link on #27 on Yahoo! Terms of Service. I don't know that you will get anywhere but it's worth a try. Thanks Manisha for the copyscape link...it really helped! I agree with you completely. The best thing about blogging is you get instant feed back. People ask questions, disagree with some of the recipes etc. Thats what makes a blog interesting than a static website. Also, others who read it get an idea with lot of tips. Thats the whole fun! But when people cross the limits, like put nasty personal comments, I just delete it. I dont care to answer them, esp when they come as anonymous. I do think if someone with a valid blogger id criticise or even put nasty comments, I would answer them. But not when they are faceless -- then I am wasting my time. That I think too is an advanatage of blogging. I have nothing against people who delete nasty comments but if someone gives constructive criticism I see no harm.And I totally agree with what Manisha said. "It is a personal space they chose to make public. That's where the difference lies". If u make your blog public, u should be open to criticism too not the good comments alone. U should be open to both. And also what difference does it make whether u post a comment with an id or without one,constructive criticism is still going to be constructive criticism. People are just trying to help and not post for the heck of it.I post comments only to help not because I enjoy criticising others.All u guys do a wonderful job with your blogs,investing a lot of thought,time and effort. All said and done I still stand by my earlier comment.That's my opinion.Everyone is entitled to their own. It is a sad state of affairs when some folks have no qualms about copying material and passing it as their own. What we can do if we know someone who has done such a thing is to pass the word around about that blog and black list it. The person concerned will be shamed into not copying so blatantly. Nabeela, happy to have been of help! Inji and Anon, thank you for a great conversation! It's a treat to have intelligent and respectful discourse on my blog! Sangeeta, I'd recommend attempting to educate the person on copyrights. Sometimes people are just not aware that it's not right. If that fails, there are other ways: report it to the web host if the site is hosted privately (www.whois.sc/domainname eg www.whois.sc/cnn.com ) will tell you who the web host is. If it is a blog hosted on Blogger, Yahoo!, Wordpress or any other free service provider, look for their TOS and/or abuse forms and report it. Make a post on your blog about the stolen material. Hope this helps! And, welcome to IFR! I loved your post - I totally agree about the mangoes, roti, amla, and Idliis!! Those are all my favorite things in the world too!!!! I haven't been the restaurant you mentioned - and I am vegetarian so I am not sure if they'd have anything for me.....but anyways, I totally agree - you got to try those things in life!! Lisa, welcome! You probably meant to post your comment on my post on 5 Must Eats. I don't have the capability to move comments to another post else I would have done so. Charlie Trotter's is a foodie's dream come true. And they do have a vegetarian menu. I was torn between trying that and the regular version. But even in the regular version, the way veggies and spices are used to enhance and complement the meat was fantastic. The next best restaurant for me - with exotic dining options - has been Cala's in Cape Ann, MA. The meal was not a series of entrées like at Charlie Trotter's but the food was divine! You sound very much like my Italian-American friend! Except that her husband is not Indian. They use Indian spices liberally and she's cooked us delicious Indian meals, including dessert! Do keep in touch as I would love to know what you are cooking up in your kitchen! I can understand the frustration with others using YOUR work, sometimes compliments come with hidden agendas. It brings to mind a beautiful Oscar Wilde quote: "Always forgive your enemies, nothing annoys them so much". Hummn.....I read Shilpa' blog then read your blog...I think one can copyright pictures. Recipes I don't think can be copyrighted. It makes one sad when someone copies but you loose out on the joy of blogging by making a huge issue of it. The beauty of blogging is sharing. Traditional recipes cannot be claimed as anyone person's. Were we even born when they were created. artizen flair that's a beautiful quote! Most of these copy-cats are clueless. Others are scraper sites that attempt to make money from ads. Here's an interesting take on What to do when people steal your blog content. AP, we all agree that a recipe cannot be copyrighted. However, the way it is described can be. That's what this whole thing is about. The blogger works hard and creates unique content, which is lifted without so much as an acknowledgement and passed off as original content on another site. Food blogging is a very productive channel for inter-cultural bonding. So we are sharing openly. However, when I make one of your recipes, I don't pass it off as mine nor do I copy it word for word from your site. What I would do is link to your site for the original recipe and write my own take on it, in my own words on my blog. This is something very disturbing. I recently started my food blog and now am wondering whether I should go ahead posting all the recipes I have collected over the years. 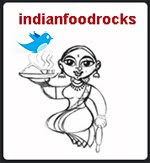 Of course, like a few of the bloggers mentioned Indian food tends to be similar sometimes. There can surely be variations to a recipe but surely not word-to-word copying. Definitely not the photos. I wish we could do something to stop this. I am sure we should circulate this info in all our blogs, so that whoever is doing it will atleast feel guilty and realize they are being noticed. Yes Manisha I agree if it is exact copy blare the horn. When I copy or adapt a recipe, I always provide attribution of the source. In that vein....what if Chris Columbus landed in Bombay instead of Bermuda?! Here is a East Indian Thanksgiving dinner I did up last year. Mike, welcome! I'm sorry I missed your comment earlier. I find East Indian a very colonial term, denigrating Indians from free India. In case you are not aware, British East India Company colonized India. And while Wikipedia may call it a "more precise" way of referring to Indians from India so that they are confused with native Americans/American Indians, I find it rather insulting actually. There is a group of people who call themselves East Indian and they chose to do so in order to show their allegiance to the British rule. It's something I feel strongly about and while it may be convenient, it is not polite. If you need to make a distinction, please use Indians from India, not East Indian. Thanksgiving is a wonderful American tradition and we, too, take this time to give thanks for our families and what we have. I usually have a very Indian meal with beans, potatoes, and turkey/chicken/fish or lamb. Your menu sounds very delightful! I personally feel that people from India should just be referred to as Indians. As we are in fact the original ones. Adhi Potoba, I agree with you there! I love the name of your blog: Adhi Potoba, Mug Vithoba! I have just started blogging and like all fellow bloggers I am hooked like crazy. Stumbled upon your article here on Copyright Infringement. Its shocking though ironically not surprising. Can you please help me too! How to get my pictures copywrighted?? I have no clue. I am a novice and a lesser mortal (no techie). Just an ardent food lover and a hard working one at that. Also do visit my blog and advice me how to improve upon it. Its just a few weeks old. thanks!